Sales keynote speaker Jeff Shore argues that boldness is required to break free of your comfort zone and win the sale. And it is a skill that can be learned. Jeff Shore will ignite lasting change and transformation in your sales team. Jeff’s sales keynote sessions include self-assessment tools, hands-on exercises, and case studies to help put all of it into action. Jeff Shore teaches your sales team the fundamentals of selling with boldness. Jeff shows salespeople how to identify and embrace their specific fears in the sales process. And he gives them concrete sales strategies, sales skills, sales techniques and sales tools that work. You also have the option to supplement the sales keynote speaker session with eight sales skills video lessons. You can use these video lessons in your weekly sales meetings after the sales keynote session to maintain motivation and momentum. 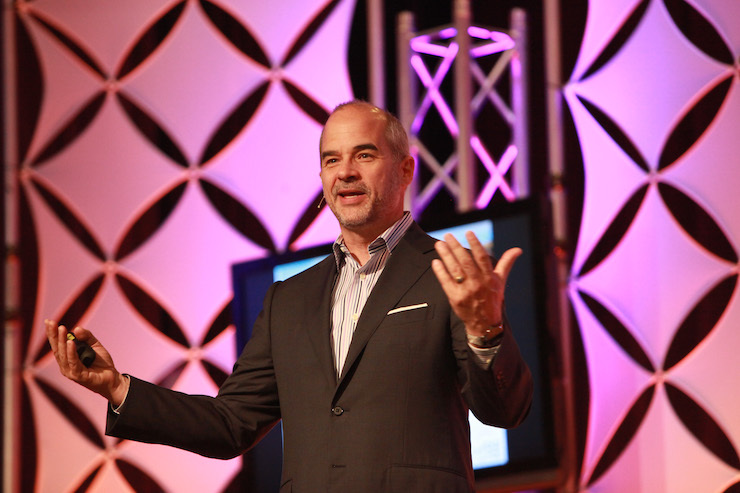 “Jeff Shore did an outstanding job as the grand finale Keynote Speaker at our three-day conference. He and his team were complete professionals from start to finish, and he surpassed our high expectations with a fantastic presentation that was rated as one of the top presentations in our post-conference survey. Jeff customized the content to fit the audience and conference, and delivered a high energy, engaging, and relevant keynote that was just what we were looking for.